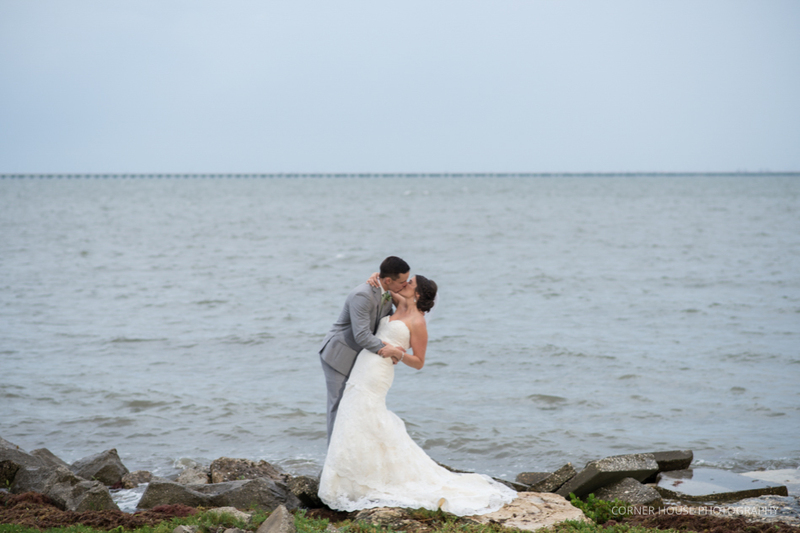 Chelsea and Bryan tied the knot during their Rusty Pelican wedding in Tampa, Florida. The two envisioned a day filled with the love of their friends and family, of which over 100 traveled from various states across the U.S. from Georgia to California. Florida State University was not only where Chelsea and Bryan went to school, but also where they met. During a tailgating party at Indian Village, Chelsea and her bestie happened to walk by Bryan’s group who were clearly having a blast of a time, from grilling up burgers to playing flip cup. Inviting the girls to join in on the fun as they passed by, the girls took them up on the offer and settled in for a game of flip cup on the opposing team to Bryan. Talking a little bit of smack during the first few rounds, Chelsea and Bryan had a chance to joke in a sweeter manner off the flip cup table after the first few rounds ended and exchanged numbers to meet up. It wasn’t until the next tailgating party though that Bryan made the leap and invited Chelsea out to come take part in the festivities. Thus began a forever tailgate love story. Besides their mutual passion for FSU, Chelsea and Bryan fell in love with each other’s personalities and how they fit so perfectly well together. As Chelsea explains, “we love our ability to be our true and sometimes weird selves together. I love how much Bryan makes me laugh.” For Bryan, he explained that he can always count on Chelsea and talk to her about anything. “We feel honesty is the most important thing in our relationship and aren’t afraid to tell each other anything.” Truly they are not only partners through their journey through life, but also best friends. That special moment began their journey to forever, which was celebrated by family and friends on their wedding day during their Rusty Pelican wedding. Looking as gorgeous as ever, we greeted Chelsea and her girls at their hotel for getting ready photos before the wedding. Making the most of our time, we also captured Bryan and his guys getting ready, a first look, and wedding party portraits, all before going to the Rusty Pelican. Chelsea surprised us with having her girls ready to go in the most adorable pajama sets, along with her mom and mother-in-law in special robes. We had a blast capturing the girls cheersing to the festivities and of course took time out for Chelsea to have a moment alone with her mom. With the help of her mom, Chelsea zipped up into her dress before welcoming her dad into the room for a daddy-daughter first look. A special moment early on in the day, it was very beautiful for our bride to also have a moment with her dad. 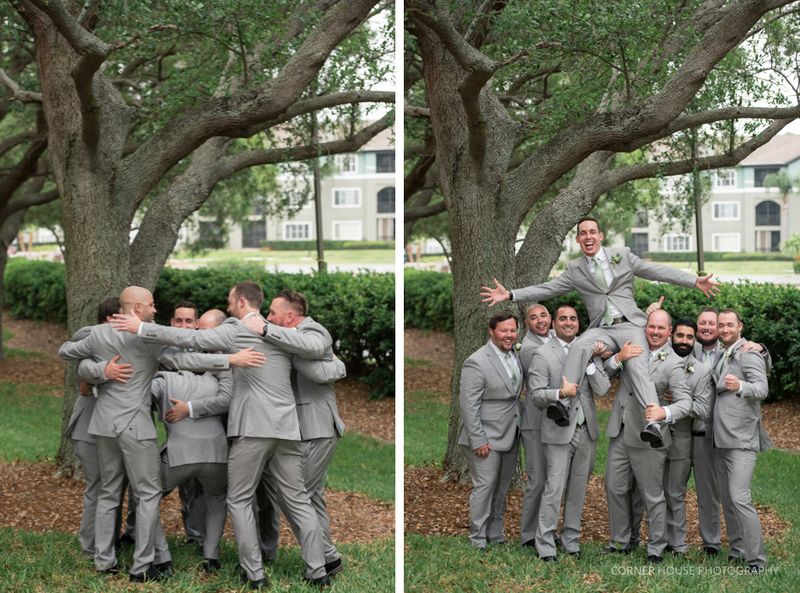 Bryan looked as dapper as ever, along with his crazy groomsmen! Stepping away from the group, we took our groom out to the veranda of the hotel to prepare him for his first look with Chelsea. Huge smiles and holding back tears, our couple appreciated having time together before everything began. After capturing wedding party portraits among oak trees and foliage at the hotel, we traveled across the way to prepare for our sweetheart’s ceremony. While storms are not always a good thing, the sky held out for just long enough for our sweetheart’s to read their vows, exchange rings, and share their very first kiss as Mr. and Mrs. The excitement on Chelsea and Bryan’s faces was surreal when they realized that had officially tied the knot! With family and friends rushing back inside as the storms rolled in, we captured their family portraits inside, along with a large wedding party portrait, of which lasted just enough time for the storms to roll out as quickly as they rolled in. Taking our couple out on the rocks nearby their ballroom area, we traveled a short distance for a beautiful backdrop of the deep blue ocean. Their reception entrance was a blast to capture, filled with a flip cup game after making their way into the room and formal dances, the room cheered our sweethearts on with excitement! Dining and dancing soon followed suit, along with our couples being lifted up on chairs for a few songs! Wishing our sweethearts an amazing life together, filled with the same love, joy, silliness, and happiness they have felt since they day they met!